UFC 232 takes place Saturday night, Dec. 29, from The Forum in Inglewood, Calif. Jon “Bones” Jones and Alexander Gustafsson will rematch in the main event for the vacant light heavyweight championship. Women’s bantamweight champ Amanda Nunes moves up to featherweight to challenge 145-pound champion Cris Cyborg for the title in the co-main event. Fight fans can watch the UFC 232 pay-per-view live stream online in the player below for $64.99. The PPV card kicks off at 10 p.m. ET/7 p.m. PT. The UFC 232 PPV main card also features a welterweight showdown between Michael Chiesa and Carlos Condit, a light heavyweight matchup between Corey Anderson and Ilir Latifi, as well as a featherweight bout between Chad Mendes and Alexander Volkanovski. 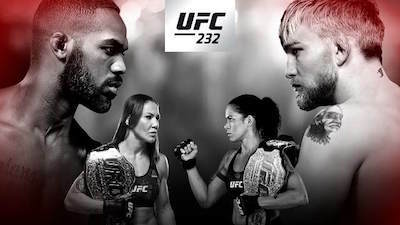 For UFC 232 live results and video highlights visit the ProMMAnow.com homepage starting with the first preliminary card fight at 6:15 p.m. ET/3:15 p.m PT.